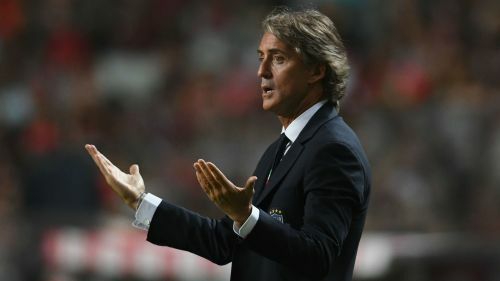 Roberto Mancini is demanding more from his forwards after they struggled to threaten in Italy's 1-0 Nations League defeat to Portugal on Monday. Portugal scored the only goal of the game through Andre Silva early in the second half, with the 1-0 win the least Fernando Santos' men deserved. "Unfortunately, we are making errors and need to try to reduce them," Mancini told Rai Sport after the game. Italy lose out in Lisbon following a goal from Andre Silva. "But the boys gave everything they had. We have to score goals in order to win, so we must find new solutions and do more in attack. "In the first half we had a lot more of the ball with the two forwards, as at least they can play between themselves up there, so it can be an important option." "We have to let them [the young players] grow, there is nothing else to it," he said. "When a player is young and he is just starting out at this level, he is going to have some problems, we knew that was going to happen. "When our fitness levels get better, that will definitely be a positive, but the main issue we need to resolve is not scoring goals."